Educating Northern Anne Arundel County students is a community affair thanks to many Arts Empowered Minds Initiative partners, including the Anne Arundel County Police Department. 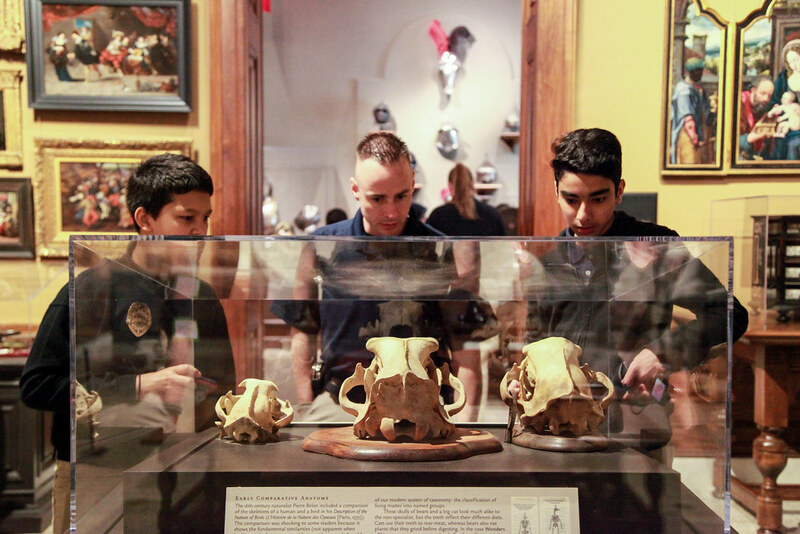 Through the Police, Artist + Community Engagement (PACE) program, Lindale Middle School Students and officers are engaged in active and thoughtful learning during visits to local arts and cultural institutions. “Love that our department and officers are so involved with students and young people in our community. Wish it got more coverage,” Lt. Ryan Frashure said. Their latest adventure led them through the collections of the Walters Art Museum with Young Audiences teaching artist Christina Delgado. Students imagined stories that might have inspired the artwork as they wandered the galleries. The docent was so impressed with the students’ participation that she took them to see the museum’s ancient Egyptian art after the tour had ended! The kids really wanted to see the mummies and she just couldn’t say no. After lunch, Christina taught the students how to properly and artfully use digital cameras and they proceeded to capture their favorite pieces throughout the museum. We cannot wait to see the museum’s collection through their eyes!